From Disney Junior’s new hit pre-school series Puppy Dog Pals, fun-loving pug brothers and best pals Bingo and Rolly love playing and exploring together! Kids can relive the fun with the action-packed two-story Puppy Dog Pals Doghouse Playset! Bingo and Rolly figures can ride on the tire swing, take the elevator up and down, play on the seesaw, slide from the second floor into A.R.F., their robotic friend, and even fly on a glider around the roof! The playset includes 3” poseable figures of Bingo and Rolly, one A.R.F. as a vehicle, and tons of exciting kid-powered features! Ages 3+. Puppy Dog Pals Doghouse Playset features: see-saw tire swing, working elevator, slide, and spinning glider. Playset looks just like Rolly and Bingo’s Doghouse from the show! The Care Bears' heartfelt message of kindness and empathy has touched many lives over the past 35 years and these loving, loyal friends are celebrating their anniversary in a very special way! The limited edition 35th Anniversary Care Bear features the new Rainbow Heart Bear in a beautiful commemorative package with a certificate of authenticity. Perfect for longtime collectors as well as new fans. Rainbow Heart's lush and huggable royal purple fur has special glittery speckles and her heart-shaped nose is a shimmery purple metallic color. Introducing the new 35th Anniversary Rainbow Heart Bear! Rainbow Heart features deluxe glittery fabrics and details. Another way fans 12 and under can celebrate the Care Bears' exciting milestone is by participating in the Create My Care Bear Contest to inspire an all-new character who will join the collection in 2018! From September 1, 2017 through December 31, 2017, unique Care Bear designs will be collected and one Grand Prize winner will receive $3,500 and have his or her design turned into a real Care Bear character! NO PURCHASE NECESSARY. MANY WILL ENTER, ONLY 3 WILL WIN. Open to legal residents of the 50 United States,12 and under. Dates: 9/1/17-12/31/17. 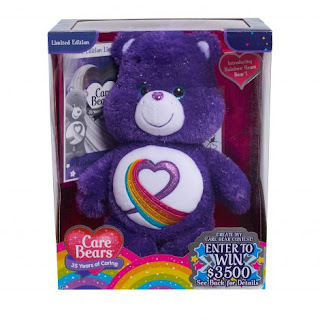 To download the Official Entry Form, or for Official Rules, including method of entry, judging criteria, and prize descriptions, visit https://www.CareBearsContest.com. Void where prohibited. Puppy Dog Pals Doghouse Playset and Care Bears Limited Edition 35th Anniversary Bear from Just Play Make terrific gifts for kids! These two happen to be two of my favorite toys from Just Play and I think my kids would agree. Whether your searching for that perfect gift to put under the tree this year or looking for something that they will cherish for all time these two toys from Just Play are sure to please! Puppy Dog Pals Doghouse Playset from Just Play is straight from the Disney Junior’s new hit pre-school series Puppy Dog Pals. My son absolutely loves Disney Junior’s Puppy Dog Pals so I knew he'd love this play set from Just Play. 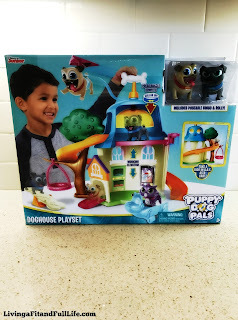 The two-story Puppy Dog Pals Doghouse Playset comes with poseable Bingo and Rolly figures and a one A.R.F. as a vehicle. This playset is hours upon hours of fun for kids that they will surely love! Just Play's Care Bears Limited Edition 35th Anniversary Bear – Rainbow Heart is amazing! I grew up with Care Bears and still to this day love them. I'm super thrilled that my kids get to grow up loving them as well. 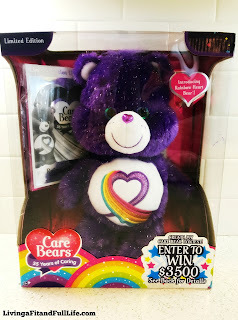 Just Play's Care Bears Limited Edition 35th Anniversary Bear – Rainbow Heart comes in a beautiful commemorative package with a certificate of authenticity. And, if you can bring yourself to open this incredibly collectible Care Bear you'll love how soft it is. Rainbow Heart's royal purple fur has special glittery speckles and her heart-shaped nose is a shimmery purple metallic color. Just Play's Care Bears Limited Edition 35th Anniversary Bear – Rainbow Heart is perfect for Care Bears fans young and old and would make a terrific gift this holiday season! Just Play has everything you need to make the holidays more fun!